Both Professionals and fans of architecture and interior design were able to attend the launch of one of the most eagerly awaited proposals by the hand of Gamadecor, during the opening week of the PORCELANOSA Grupo XXII International Exhibition: a new model in the range of Emotions kitchen furniture, which combines an innovative and practical design with the use of the latest technology for manufacturing. 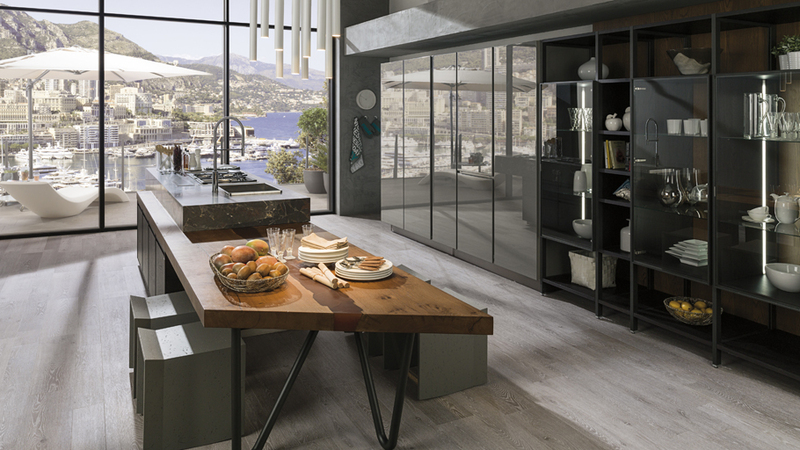 The combination of the E6.20 island in Night Oak and Sil Oak finishes, together with the E5.30 furniture in shiny Lead finish, make up a model that updates the traditional concept of kitchen spaces. The use of noble materials in a modern and different design, besides a simple and elegant tonal range, provide a unique personality to the new series by Gamadecor. With this new kitchen model, Gamadecor manages the available space more efficiently, creating a large capacity furniture with 70 cm depth and the reduced skirting size only being 6 cm. In addition, the countertop’s greater height which besides increasing the area to organise utensils, it also allows you to work more comfortably. In relation to the care and stylish design of this new Emotions kitchen model, one must add the use of high quality materials and manufacturing processes with the latest technology. For the best finish, all interior structures are edged with laser technology, guaranteeing a perfect and watertight sealing of the edges. The final result is a much more lasting technically superior kitchen which remains highly resistant through time.